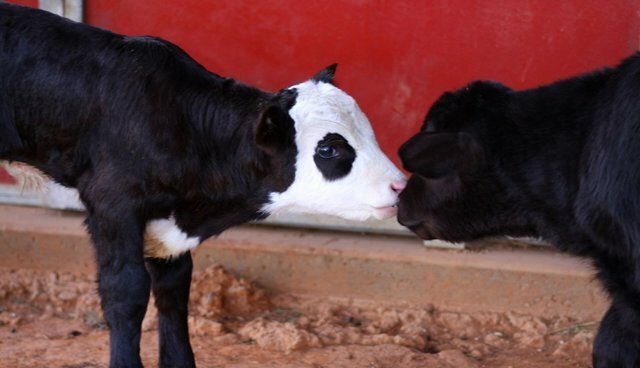 There are few creatures cuter than calves and even fewer than TWO calves! Check out Bob and Mortimer, saved by Animal Place, as they frolic in their yard. Bob is black and white. He appears to be part-panda, part-calf. The farmer bred his mom to sell Bob for slaughter. The farmer allowed the cow to become so ill, she couldn't stand up. Confiscated by animal control, Bob's mother survived long enough to see and greet her calf. Sadly, she died before both she and Bob could be brought to our 600-acre sanctuary. Luckily, Bob had Mortimer to bond with upon arrival. Mortimer is from a small farm using cows for grazing. Abandoned by his mother, the day-old calf was picked up by the farmer. He arrived ill and needed major surgery to recover from a hernia and other problems. While ill Mortimer had to rest inside a large "dog" run. Bob never left his side. Bob and Mortimer will live out their lives at Animal Place.